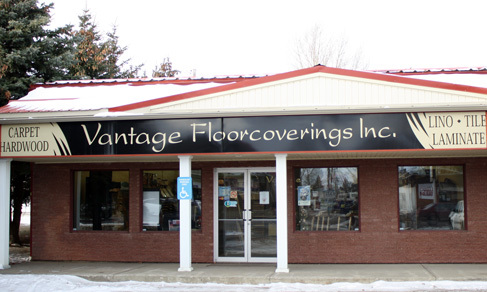 Way to connect with Vantage Floorcovering in Leduc- Vantage Floor Coverings Inc.
We recently had Vantage replace the carpet in our office tower and the end result has been met with positive comments only. The focus of this project was to not interrupt the office staff. I am pleased to say that Vantage was able to accommodate. The staff went home at the end of the day and returned the next morning to an office with new carpet. Vantage arranged for the removal and the replacement of the office furniture for this project. Our staff was most impressed as there were three offices done per night in this fashion. Most impressive! I am confident in saying that your firm would be pleased should you choose Vantage Floorcoverings Inc. as your flooring contractor. "I would recommend Vantage Floor Covering to anyone"
I have been extremely satisfied with Vantage Flooring in every respect. Their execution of the work was professional. They were always responsive to site conditions, and they always kept me informed of their progress. The craftsmanship of flooring projects is of exceptional high quality. I would recommend Vantage Floor Covering to anyone considering flooring projects. Vantage Floorcoverings Inc. has done work for the City of Leduc for approximately 6 years, with very good results. The work has ranged from small to large on all types of floor surfaces. Through my interactions with VFI, I have found them to be responsive to ideas and direction, bringing forward best practice recommendations, while ensuring that the quality of the finished product is not compromised.